On the evening of March 5, 1903 twenty-four women crowded into a small home at the southwest corner of Perth Road [county road 59] and Concession 10 [Perth Line 47] North Easthope township [Perth East Ward]. This inaugural meeting of Hampstead Women’s Institute included a group of local woment who were committed to community by recording local history, promoting advocacy and teaching homemaking skills. This birthplace of Hampstead Women’s institute still stands. The little blue board-and-batten house serves as landmark and a reminder of the many women who served their community. 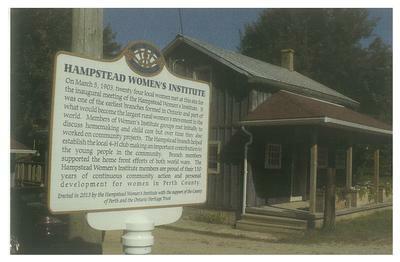 At this site, Hampstead Women’s Institute erected and unveiled a Provincial Heritage Plaque (Marker) on September 24, 2013 which proclaims their contribution to local history. This branch has been a positive factor in the lives of women and their families for over 110 years in Perth County. Such plaques make history come alive by telling stories of the people, places and events that have shaped may rural communities in our province. "On March 5, 1903, twenty four local women met at this site for the inaugural meeting of the Hampstead Women's Institute. It was one of the earliest branches formed in Ontario and part of what would become the largest rural women's movement in the world. Members of Women's Institute groups met initially to discuss homemaking and child care but over time they also worked on community projects. The Hampstead branch helped establish the local 4-H club making an important contribution to the young people in the community. 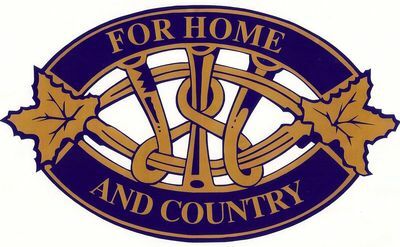 Branch members supported the home front efforts of both world ward. The Hampstead Women's Institute members are proud of their 110 years of continuous community action and personal development for women in Perth County. Erected in 2013 by the Hampstead Women's Institute with the support of the County of Perth and the Ontario Heritage Trust."